Home » Notice » Teachers Service Commission » Teacher Service Commission Written Exam 2074 Important NOTICE! 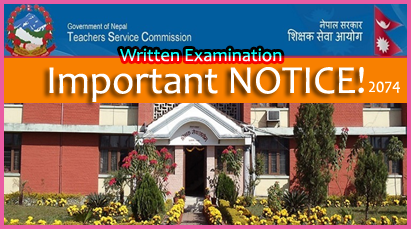 Teacher Service Commission Written Exam 2074 Important NOTICE! 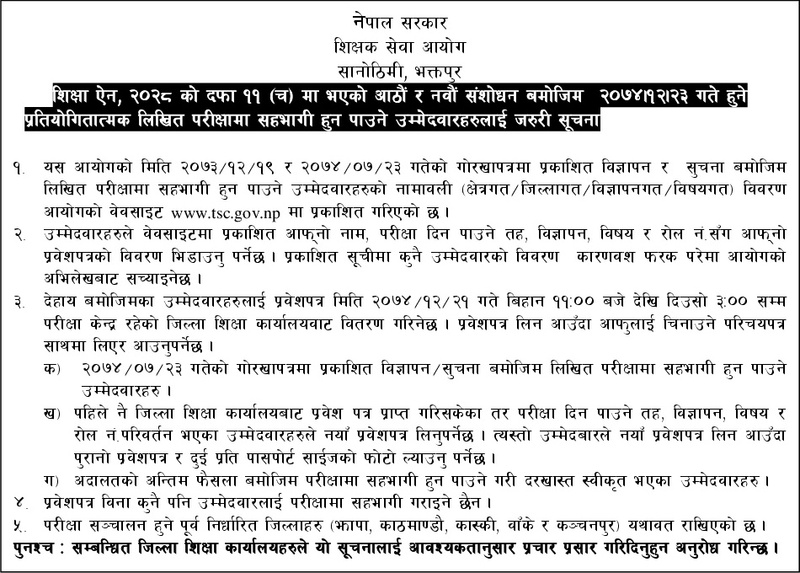 Important Notice from Teacher Service Commission 2074 Written Examination. On 22 Falgun, 2074 [6 March, 2018] Teachers Service Commission (TSC) has published the important notice for the candidates who are participating in the competitive written examinations conducted by the commission as per the advertisement of the dates 2073/12/19 and 2074/07/23. The candidates are instructed on the various points regarding the sitting for the examinations. The merit list of the candidates for the written examinaiton are published in the official website of the Teacher Service Commission (TSC) www.tsc.gov.np. Entry card will be distributed on 21 Chaitra, 2074 [4 April, 2018] from morning 11:00 am to 3:00 pm from the District Education Office of the respective examination centers. View the important notice published by Teacher Service Commission (TSC) Nepal. Or You may download the Notice published by Teacher Service Commission from their official website. For PDF Download Click HERE. 0 Response to "Teacher Service Commission Written Exam 2074 Important NOTICE!"